This section has members from all regions of Western Québec, particularly from the regions of Montreal, Sherbrooke, Outaouais, Abitibi-Témiscamingue and Centre du Québec. 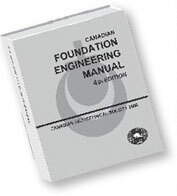 The Western Québec Section hosts technical presentations between September and June, a student contest in March and a conference dinner in June. The following activities were carried out in 2016-2017: 6 presentations, a student competition and a conference dinner. For 2018, the Western Québec Section will offer the other sections of Canada the opportunity to participate in its technical presentations by videoconference. 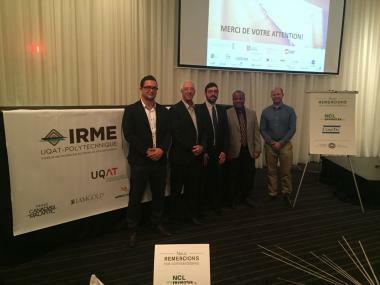 Left to right: Philippe Capozio (NCL Envirotek), Guy Doré (Université Laval), François Duhaime (Chair, Western Quebec Section), Michael James (IRME), Will McQueen (ConeTec). Guy Doré ​was invited to give a lecture at the 2017 annual conference dinner. Please contact the Western Québec Section at qcouest@cgs.ca if you have any comments or suggestions.